The Tibetan monks have prayer wheels upon which are inscribed the order of prayers that they offer as a part of their religious duties. The image of a wheel spinning with the mind elsewhere always seemed odd to me. The idea of using an inanimate device to speak of my inner yearnings seemed odd. The monks seemed comfortably foreign. Then there was one of the few pieces of assigned reading that resonated in any way as I was growing up. The Courtship of Miles Standish was about an officer who was too shy to approach a girl himself for purposes of courtship. Predictably, his chosen intermediary got the girl. A modern spin on this is the Don Williams song, " Listen to the Radio the lyrics of which portray a tongue tied suitor who tells his beloved that the radio speaks for him far better than he could for himself. I sometimes feel that sitting back and letting a CD speak for me is sometimes better than speaking for myself. In some ways, gifted singers like Williams are like the village letter writers in the days of rampant illiteracy who extended the gifts of literacy to the unlettered masses. 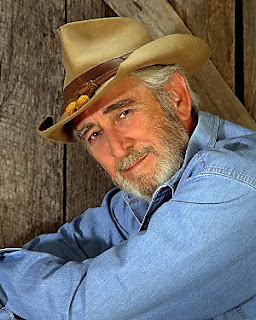 Don Williams has that gift that enables him to portray and give voice to the simple and tongue tied with an eloquence that resonates as does his voice. Although country music is seen as a distinctly American genre, Don Williams' popularity does not stop at our nation's borders. He has gone on world tour to enthusiastic audiences in the United Kingdom, India and Africa. He was already well known and appreciated in all of those places. I have often had the feeling when watching African music videos that there were certain common thematic qualities that tied African music at least as much to American country music as to any other American genre. Apparently, Don William's African fans feel the same way. It is not hard for me to understand the universal popularity of Don Williams. I wish him well and hope to hear a lot more from him in the future. I am presenting below two videos. One is of "One Good Well, and the other is "Till the Rivers Run Dry" from the Don Williams Africa tour.